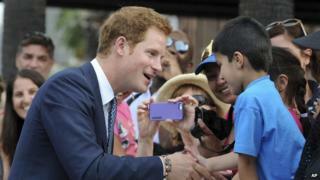 Prince Harry kicked off his first official visit to Australia at Sydney's impressive city harbour. The Prince attended a special event to celebrate a hundred years since the original Royal Australian Navy fleet arrived at the harbour. Hundreds of thousands of Aussies turned out to see the Prince and the huge fleet of around 40 warships. The warships taking part are from the U.S., China, Britain, Brunei, Micronesia, France, India, Indonesia, Japan, Malaysia, New Zealand, Nigeria, Papua New Guinea, Singapore, Spain, Thailand and Tonga.